Can a contemporary film address the tired genre of New England witch films? Robert Eggers makes his directorial debut banking on the fact that he has brought something new to the genre, and while his film executes on a number of levels, strength of story is not one of them. Overly-proud town preacher William (Ralph Ineson) is banished along with his family due to a disagreement with the corporation of his 17th century New England settlement; the exact nature of the offense is only vaguely hinted at, but he seems to be a bit of a holier-than-thou type. William’s homesick wife, Katherine (Kate Dickie), grows bitterly resentful as they trudge to the edge of the woods with their young children, the youngest of which is not long for the world and whose loss throws her into a deep depression. Their children, the teenager Thomasin (Anya Taylor-Joy) and her younger brother, Caleb (the aptly named Harvey Scrimshaw), function as something of surrogates for their parents: the boy learning the ins and outs of trapping and preaching, the girl assuming the duties of the mother on the homestead including child care (despite the disastrous loss of the aforementioned baby while under her care). Early in the film, it becomes clear that this is not a metaphorical witch in the ilk of Miller’s Crucible , nor is it the never-seen phantasmagorical witch of The Blair Witch Project . This is your straight up, child-stealing ancient hag, casting black magic in her hovel and running naked through the forest. The closest comparison characters I can summon are the witches in Roman Polanski’s Macbeth (1971), where there’s nothing glamorous or seductive about the witch lifestyle (at least not without some appealing supernatural artifice). That interpretation of the witch folklore seems to match the grinding punishment and defamiliarizing nature scenes through which the family must persevere. Although they wake up on the first day of their banishment covered in mud and swarmed with mosquitos, one quick cut later they are living in a finished house with a bustling farmstead replete with goats, chickens, and a nearly finished barn. That scene of domesticity is quickly interrupted by the tragedy of the lost child, transporting the family into an panoply of migrant fears (most of which are better represented in Terrence Malick’s The New World ). Then settles in the daily grind of settlement life: the crops are failing, food is dwindling, and the bleak grayness of winter looms like a specter. The film looks really sharp, with a number of well-shot reaction close ups that amplify the horror scenes. Eggers clearly paid attention when watching his Kubrick, borrowing the atonal wailing chorus of 2001: A Space Odyssey to supplant diagetic sound as characters encounter their worst fears. There are not many traditional jump scenes, the director instead focusing on creating an uneasy vibe that matches the strangeness of the archaic speech patterns and bizarre religious incantations (I find Puritans to be an inherently creepy set– nothing sets up a suspense film like tightly-wound fanatics). Likewise, Eggers really brings out the horror of the natural world, whether through a dead animal or the numerous ways that nature is dispassionately at odds with our survival. All that being said, the film fails to deliver on any real subtext. Each of the characters had a particular sin that they were punished for: pride, wrath, lust, etc. Had the punishments matched the crime in more instances, I would have seen the subtext: the devil and hell are real and we are all punished accordingly for our mortal sins (though I might have slammed the film for being too obvious then). Another possible outlet was the concept of original sin, which is certainly touched upon in the film, but slowly fades away as the film progresses. The devil certainly assumes the role of nature run roughshod over these suffering settlers, yet I can’t help but find the representations to be painfully obvious. A witch that presents as a “secret, black, and midnight hag,” skittering around the woods with her familiars, doesn’t do much in terms of bringing something exciting to the genre. Neither do the sometimes obvious representations (the devil as a goat, the so called “devil’s book” as a literal book, etc.). The period settings are very of-the-period, and the gross outs are super gross, and it’s not exactly as if the plot beats were telegraphed; it’s just that everything I expected to happen eventually happened ten minutes later. There were no “left turns” or “curve balls” or whatever you want to call them. It’s a damned shame the film didn’t come out in the fall around Halloween, when you could leave the theater to crisp air and barren trees instead of chattering birds and sprouting buds. 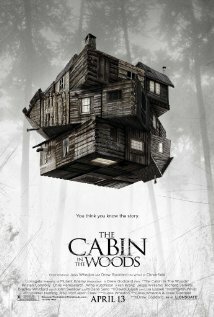 Perhaps my disappointment with this film rests with the fact that some of the best “dark woods as devil’s domain” films I can think of off the top of my head do something brand new with the genre: Evil Dead 2 , Blair Witch Project , Cabin Fever , Cabin in the Woods . There’s more meta-level commentary on the genre in those films, and this film is sorely in need of some tongue-in-cheek moments to break up the grim Puritan vibe. It’s taken so seriously that there’s a title card at the end of the film slapping you in the face with the writer/director’s historical research. 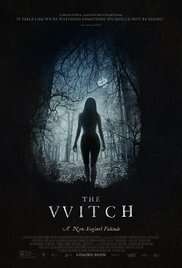 My final verdict is that while this is a well-researched, well-shot, well-produced film that looks and sounds great, it really can’t breathe any life into the witch genre because, in the end, it champions utilitarian execution to the exclusion of insightful commentary on the genre. It feels like the gritty, modern, ultra-serious remake to a campy 1950’s thriller that doesn’t exist. 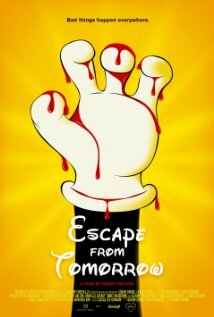 “Well, pack the family and head on down to Disney World,” is not what you will be thinking after you watch this film. I find it amusing that my last entry (my 100th post, BTW) was about me complaining that critics made nothing into something, while this entry I feel like something was made into nothing. Moore’s film focuses on the surrealist hallucinations of the protagonist, Jim (Roy Abramsohn), as he enacts middle-aged, libido-fueled fantasies whilst his nagging, child-obsessed wife Emily (Elena Shuber) stifles and emasculates him. The real star of the film, according to critics, is Disney World itself, as the film was shot on location without permission from the cryo-frozen head of the man himself. While it is amusing to seem some childhood memories shot in psychedelic, deep-focus black and white, the film could have really taken place at any amusement park as they all have that creepy simulacra thing going on. There’s another, more mundane layer to the film that deals directly with gender dynamics, parenthood, and the ways in which we all cope with stress. Each disturbed character, even though they are in the “happiest place on Earth,” comes off the rails in increasingly hostile and self-destructive ways as the film progresses. The film and place resemble a vortex, with the trajectory of all who are sucked in spiraling towards a personal nadir. As a personal side note, I can remember seeing drunk people fighting at Disney World and being escorted off by security guards. I also remember the personal entitlement I felt as a child, feeling like the whole experience was mine. It seems a disgusting enterprise now, but I doubt I could communicate that to my six-year-old self. The nadir of the place is really for everyone who goes there (at least by the end of the trip), and I can’t really imagine anyone wanting to go back independent of having children who drag them back in. I suspect there’s something to be said about the hedonistic, sociopathic nature of children here as well. They demand constant entertainment and attention out of adults. Jim, clearly on the last moments of tolerance at some points and preoccupied by the loss of his job, is left to fend for himself emotionally as his wife overcompensates for his increasing distance by doting on the children. There is something uncomfortably Oedipal as his young son locks him on the hotel balcony at the beginning of the film, then assumes Jim’s position in bed next to Emily with a disturbingly blank stare. Likewise, Jim gravitates towards two French girls (one conspicuously in braces), enacting his own inappropriate fantasy. Children, until they learn empathy, feel little more than need and anger, and we take them to a place that supposedly satiates the raging id. What then is left for the grown ups in this situation but perhaps to mirror the same behaviors: apparently drink and libido (Jim) and barely constrained aggression (Emily). There is much more here to unpack than there ever could be in Leviathan , yet critics much preferred that film. The cinematography alone in this film is much more striking, and even though it sometimes plays like so many broken shards from a witch’s amulet, the whole is much more intriguing. Nicole and I managed to wedge in one more film from the CIFF, and what a surprise, it was another horror film. 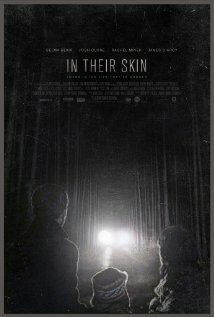 In Their Skin tells the story of the Hughes family, who has just recently lost their young daughter. The father, Mark (Joshua Close) and mother, Mary (Selma Blair) have a marriage that is reduced to shambles, and a trip to their swanky cottage out of season is clearly the last attempt at salvaging their relationship and family (they have a young son). After arriving, Mark encounters an oddball “family” inexplicably stocking the woodpile outside his back door at the crack of dawn. After a tense encounter, Mark invites them over for dinner along with his brother (apparently trying to interject anything and anyone into the mix to dispel the unbearable tension between himself and Mary). At the dinner, it becomes clear that the neighbors they have invited into their house are not in the same social class by a longshot, as they ask question after uncomfortable question of them, including such class reminders as “How does someone get a house like this?” and “I’ve never had dinner with a lawyer before,” etc. The situation escalates until you have a standard, though slightly amped up version of a home invasion thriller. In the Q and A following the film, Regimbal made it clear that the class difference was central to the architecture of the plot, yet I found a bit of fault in the standard privileged urbanite=good/victim versus hillbilly=bad dichotomy that this film perpetuates. Coming from a small town, not everyone is a deranged hick waiting to violate and kill your family, I promise. Most horror films tend to desperately cling to this mantra, and this film does little to challenge it; there is a lackluster attempt to prove that rich urbanites are not perfect, but mostly they struggle with “rich person problems” while the crazy hicks act all stupid crazy. In our post film discussion, Nicole pointed out to me that there was a lot of subtext about identity and how people freely give away information, which in itself is a huge anxiety explored in horror films. I admit I missed that subtext a bit, and that dimension salvages the film for me. The original title of this film was Replica , which makes sense given the later revelations of the antagonists with respect to identity theft. I suppose that a rewatch might reveal that the initial conversations which appeared only as odd might in fact contain a great deal of suspenseful probing as Nicole suggested. And, as it happens, a rewatch (or first viewing in your case) is not out of the question as the film will open next month in U.S. and Canadian markets. To me, the film was strongly reminiscient of Cape Fear (1991) in many of it’s plot points. Also, Rachel Miner (who plays the crazy lady) appears to have taken lessons from the Juliette Lewis school of acting. I also heard Funny Games (2007) bandied about during Q and A, though I haven’t seen it. If you are into home invasion thrillers, this film is a solid entry with some interesting subtext that offers a slightly new contribution, but ultimately needed a bit more ingenuity to make an original contribution to the genre. Nicole and I went to the (most likely) one and only film from the CIFF that we can fit into our schedule this year due to dissertation / conference related activities, and it was pretty decent. If you have the time and a little cash, you can check out the festival all through this week at AMC River East. I recommend advanced ticket purchases if you care a great deal about a film, but you can get box office tickets pretty easily. The description of this film offers it up as an “updated version of cult Japanese horror film Ringu for the dot-com generation,” and though there are some similarities, it doesn’t resemble much about Ringu from what I can remember of the film. Both involve viewing and distributing a disturbing piece of video linked to a vicious ghost, but Don’t Click offers a much fresher take on the archetypal chain letter anxiety that is at once similar, and also distanced from traditional narratives of this type. Adding to those typical anxieties is a pervasive sense of surveillance, which I found really interesting having just read a bit about social media surveillance and having attending a conference where privacy was discussed extensively (one of the professors on my dissertation committee who gave a talk at the conference is a privacy expert as well). The landscape in which the characters interact is not only flooded with top down surveillance in the form of store surveillance cameras and CCTV public safety cameras, but it is also dominated by peer surveillance in the form of cell phone cameras. The protagonist of the film, when she notices disturbing behavior from her teenage sister (whom she cares for) installs surveillance cameras in her home, as well as a mobile camera and GPS tracking device in a Trojan teddy bear placed in her room. It’s no coincidence that the protagonist’s boyfriend works as a consultant to a computer crime division at a law enforcement agency. The boyfriend approaches the little sister to help mend his relationship to big sis, but the little sister demands a banned viral video which approximates the cursed videotape in Ringu or it’s Americanization, The Ring (2002). A a quasi-spoiler (I’m not sure what it would spoil, but it may ruin something for you if you want to watch): it turns out that the ghost can only kill you when you see yourself on camera, be it cell phone, CCTV, or other. The film in general takes great care to make computing, the use of cell phones, and all technology-associated camera work convincing, which is something that American films sorely lack. I can’t tell you how many times I’ve been irrationally aggravated at people typing in search engine text boxes that are right-aligned, or using some operating system that is clearly Windows, but disguised for some stupid reason (probably related to copyrights or defamation). I wanted to ask(/compliment) the director about this, but the Q and A was short due to the end time of the screening (12:30am) and the need for questions and answers to be translated. Some minor aspects of the film failed in the international setting. The subtitles were poorly done (I assume at the last minute) and difficult to read/understand. Also, a lot of the semantic web content had captions that appeared for only a fraction of a second. It is obviously a tough problem to capture content of that nature: popular websites for us have a familiar appearance that we grow accustomed to and need only view for a fraction of a second to glean their meaning. Try looking at some sites from your past on archive.org and seeing if you can recognize them then versus now. Unfamiliar layouts, colors, and other branding issues really obscure what we’re supposed to be seeing (in addition to the obvious language barrier). I assume Korean internet users got much more out of those brief screen shots that I did. Apart from the information gap, there was a huge amount of screaming in the film. At some points, I was reminded of the dinner table scene from The Texas Chainsaw Massacre (1974). The volume was poorly adjusted, so it was piercingly loud. If you know me, you know that I am deaf as a post, and it was still painful to experience the shrill screaming for at least 50% of the film’s runtime at the volume in that theater room at AMC River East. In this case, a home viewing might have been preferable as I left the theater with a splitting headache. You can still get tickets for the showing on Friday, 10/19, though the director will not be present for Q and A.
It’s Halloween time folks, and that means watching horror films with my wife while blowing off a myriad of work: dissertation, posters, data collection, dishes, taking out the air conditioner, etc. Below find part one of a Halloween film roundup with both new and old films that I have watched recently. If you know my wife, you know that there shall be many more films, so I plan to write again after Halloween to get to the really good stuff. Not to start off on a hack note, but I didn’t actually watch the whole film. I missed fully 25-30 minutes from the beginning, but Nicole caught me up. The premise of this film follows Michael Keaton’s character who makes contact with the spirit world, which includes his deceased wife as well as a host of malevolent spirits, the former guiding him to intervene and prevent corporeal catastrophes, the latter trying to kill everyone. While bringing the scare factor in terms of jump scenes, many of the scary monsters are blurry images which surface from a, you guessed it, white noise screen. It’s the equivalent of visual EVPs. If you grew up in the country, you probably became well acquainted with this phenomenon when trying to watch late night horror films as an adolescent, so you may have flashbacks to angrily adjusting a rotary antenna dial, which is horrifying in its own way. Ed Burns is a detective who investigates the disappearance of his sister and a motley crew of co-op living psychology grad students. Each new target of a malevolent spirit receives a phone call from the previous victim, with a distinct ring tone, that contains both a voicemail and a timestamp with their, um, expiration date. Even at 87 minutes, this film seems a bloated and misguided. The deaths begin in the Final Destination “series of unfortunate events” style, then inexplicably turn supernatural in execution (no pun intended). The supernatural element, to put it politely, borrows very generously from The Ring (2002). The editing and storyline aside, this film was mildly entertaining despite the fact that I confused it with another (better) college campus cell phone horror film. I attempted a search, but apparently cell phone related horror is now a subgenre unto itself, so that film will remain a mystery (barring commenter assistance). Kevin Corrigan (bit player in infinite roles) plays a painfully introverted, emasculated ice cream parlor worker recently released from a mental hospital who holds a huge grudge against the high school bullies that pushed him over the edge. In a tongue-in-cheek surrealist film full of postmodern, self-aware characters, the laughs come late as much of the setup builds the drudge that is our protagonist’s life. If you can stick out the film’s sluggish first half, you’ll be mildly rewarded by the minute steps the characters take toward “fully functional.” However, for everything that works in this this film, the acting work largely falls flat and the writer and director’s versions of “hick” or “white trash” come off largely in broad strokes, ultimately pigeonholing actors: when you sift away the postmodernity, the cliche characters remain cliches. If this film franchise is known for anything at all, it is the new and inventive ways in which accidental situations compile to a catastrophic fatality. I assume at this point that these films are requisite viewing for industrial design students, and they bear more than a passing resemblance to the “It only takes a second” insurance video series I first encountered when I went to a Found Footage Festival screening at the Empty Bottle five or six years ago. Each film subsequent to the progenitor has elaborated slightly on the mythology, but they remain mostly static in terms of plot (note: I have [sadly?] seen them all): a psychic, or otherwise special, teenage protagonist is stricken with a vision of impending doom on some kind of vehicle, airplane, roller coaster, or other conveyance. Number five is a tour bus full of college interns at a factory stuck on a collapsing bridge. The protagonist awakes from his vision (for some reason, I think the protagonist is always a male) and saves a select few from their death. But the film is not over, oh no, not by a longshot, because Death with a capital D doesn’t like mistakes, so he is determined to correct any abnormalities in the cycle of life by terminating the survivors in new and intricate ways. If you watch any of these films, it is for the way the directors present the gruesome and tense sequence of events leading up to a brutal “accident.” In successive films, writers and directors have gotten more creative, but the premise of the film remains the same. This latest film tries to spice things up with some witty references to previous entries, but it looks like it was far more exciting in 3D with rebar and glass shooting at your face. Sadly, 3D films give me a migraine, so I will never fully enjoy the artistic merits of this gem of cinema, but it is a worthy entry in this franchise and a strong public service announcement for Life Alert personal safety systems. That is probably the worst of the crop, but watching good horror films (as I am coming to understand) is a progressive exercise like lifting a rock, then a slightly larger rock. As the end of the month when the horror season tapers off, expect a report of the good stuff. Until then, later ghoulies. p.s. I bought a Star Wars pumpkin carving kit at Target that is clearly for children, so expect pictures later this month of my attempt to do what a seven-year-old can easily accomplish with minimal parental assistance. As I had some time recently, I thought I would start up my blog again briefly. I probably won’t have much time to post on pop-culture ephemera until this summer, but since my series about my father’s health and the healthcare system is on hold for the time being, I figured I would pick up where I left off, which would be (of course) with some trashy films. This is a spring break film if ever there was one: short, badly awesome, and done. 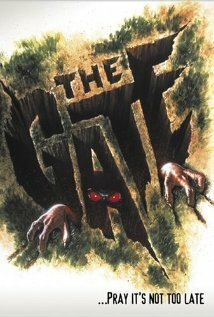 The main gist is that a boy, Glen (Stephen Dorff), accidentally digs a hole to hell in his backyard which releases a whole variety of demons to torment himself, his junior-metalhead friend Terry (Louis Tripp), and his teenage sister / babysitter Al (Christa Denton). If you grew up in the 1980’s there’s a lot of nostalgic moments, including model solid fuel rockets, some eighties Celtic demon metal (with spoken word incantations and a spell book LP insert), and plenty of bad clothes. As a side note, I was too young for most of these trends; however, one time I did have a mullet. My brothers took me to Super Cuts in Crystal Lake after we finished work. I was around six or seven, and they told me it looked cool (which it totally did). I think my Father almost punched a hole in the wall when he found out (he served in the Army, and hair that brushed against the collar was unacceptable in our household). The people in the film are far more glamorous, in a Family Ties way where the fashions are just devious enough to suggest popular youth culture, but only tangentially approaching punk rock. The overall feel of the film with its claymation demons and weak visual effects suggests that it’s not trying very hard, but the film definitely takes a couple of turns toward serious horror. The cold open with young Glen walking through a deserted house in a dream sequence certainly suggests that there will be some scariness, and in a later scene Takács prefigures del Toro’s monster from Pan’s Labarynth with the palm-of-the-hand eyeball, but the film quickly turns into a campfest/gross out that is equal parts kid flick and teen comedy. I got a strong vibe of Adventures in Babysitting (1987) crossed with your standard Disney movie of the week. As you might guess, those rocket models play a crucial role in both the reconciliation of Glen with his sister AND the slaying of the mega-demon who comes to steal the souls of teenage girls and nerdy hair metal children alike. If you miss the 1980’s so much that you want to barricade yourself in a darkened room and replay endless films that enshrine your lost era, this film is a worthy addition; however, you might see more comically oversized spectacles on a walk through Bucktown than in this film, so maybe you are one 10-year fashion cycle away from pining for this type of nostalgia. As for Tibor Takács, he went on to direct such gems as episodes of The Red Shoe Diaries and, quizzically after that last credit, Sabrina the Teenage Witch . I think I also saw a film starring Rutger Hower somewhere in there. The Rite, on the other hand, reads more like a watered down version of The Exorcist (1973), and I would recommend you watch that film instead. Anthony Hopkins gives the film’s best performance, but that isn’t totally surprising given that the other characters in the film are not given very much to do. When priest in training Michael Kovac (Colin O’Donoghue) goes to Rome to take part in a course that teaches him how to conduct a proper exorcism (and by extension, extinguish his religious skepticism) he meets with Hopkins’ exorcist priest. There’s some religious themed debate between the principle characters on whether exorcism is nothing but an antiquated custom that harms mentally ill persons by preventing intervention by the psychiatric community; but like a bad Law and Order episode, the discussions are just factoid-esque talking points from a USA Today infographic that are wadded up and forced into actors mouths to be regurgitated at regular intervals. Chances are, you’ve already had a more meaningful discussion on the topic in your head while waiting in line for tickets. In terms of bringing the scary, apart from the occasional jump scene (including the ubiquitous cat-jumping-out-and-snarling) there is not much to speak of, except for a red-eyed demon mule. Keith Phipps, in his review downplays the role of the demon mule too much. If you’re watching this film for nothing else, the demon mule is pretty badass. However, you might be disappointed when the mule just stands there and does nothing, especially after the little boy who it has been terrorizing builds the demon mule up with a story about how it’s kicking and biting him in his dreams. The exorcism scenes themselves are spaced much too far apart, meaning we have plenty in the way of boring exposition which bloats the run time well past where it needed to be. Rome, with it’s old buildings and narrow streets, could not have looked less scary. The cinematography in this film is a flop, with shots that should be unnerving or strange falling flat on their collective face. The most laughable sequence is in a futuristic situation room where a Vatican priest is operating a high-tech touch screen interface. It was like DiVinci Code meets Transformers. In my entry on The Fighter I talked about how boxing films are inevitably compared to Rocky, and I would argue that no exorcism film can be discussed without thinking about The Exorcist. There is one cast off line by Hopkins’ character which answers the obvious question “How can the characters exist in this world and believably pretend not to know about this film?”, but this film doesn’t really do anything new for the exorcism subgenre of horror. By far the most shocking part of this film is that in the course of writing this review, I’ve discovered that this film has the lowest rating (17%) on RT of any film I have ever written about on this blog. Seeing as I have reviewed gems like The Condemned and Pet Sematary II, I am genuinely stunned. While The Rite is certainly not worth all of the critical badmouthing it received, it’s not really worth sitting through either. I suppose when I think of the 1940’s, 50’s, and early 60’s in cinema, I am usually weary of being bored to death. I know that is really stupid, but that’s just the way I feel. Allow me to bore you by elaborating. To watch one station or another, the aerial had to be pointed in a very specific direction, which seemed to change based on channel, time of day, and phase of the moon. What all of this meant is that watching a different channel on each TV was relatively pointless since the aerial had to be adjusted for the channel to come in, and my parents were the masters of the aerial control box. To wit, I mostly watched what my parents watched. Our local public television affiliate, WTTW, used to show a myriad of films from the golden era of Hollywood, but for whatever reason the films that they showed were mostly not what you would call “classics” (maybe they were really short on funds back in the day??). When we got cable when I was 14 years old, my television life was revolutionized. I used (or perhaps squandered) my new found freedom to watch MTV and endless amounts of hockey games on ESPN2. There was a channel, however, which plagued my existence on family vacations where only one television was available. A channel whose mission must be to inhabit the cultural space that exists as an antithesis to everything hip and cool in the world of a teenager. That channel is Turner Classic Movies. As a young lad, TCM was the embodiment of everything boring in cinema. When you consider the channel’s mission, however, it doesn’t and shouldn’t bode well for capturing a young audience. They show only gilded era films, 24 hours a day, 7 days a week. Given the amount of garbage that exists in almost every era of film making (even those prepended with the word “gilded”), you are almost never likely to watch a film that you had the remotest interest in seeing. Also, there is a 99% chance you will start watching in the middle of the film: remember, there were no DVR’s in 1994. However, as I progressed out of my 14 year old “I think everything old is stupid” phase, I started to really appreciate some films from that era. I could name check a few black and white classics that opened my eyes to early era cinema, but I’ll save it for later. If you are weary of entering the black and white era, What Ever Happened to Baby Jane? could be a possible gateway (term admittedly stolen from AV Club’s gateways to geekery). The story begins with two children: Baby Jane, a child star (Bettie Davis) and Blanche (Joan Crawford), a successful adult actress. While Blanche has a stellar career as an adult actress, her sister Baby Jane is unable to parley her darling child act into a successful career. After many years of bitterness and jealousy, Baby Jane is responsible for an accident that costs Blanche the use of her legs. As adults, Blanche is a prisoner in her own house and subject to the bitterness and abuse of the emotionally regressive and alcoholic Jane. The film follows their relationship as the tensions between them escalate to violent and dangerous levels. What really stood out to me in this film was the casting. According to my go to sources (IMDB and Wikipedia) Crawford and Davis didn’t much care for each other, and both were actresses whose heyday was well behind them at the time of filming. In an real-life parallel that seems too close to be accidental, Baby Jane takes an ad out in the paper looking for a piano player to revive her act; Davis took an apparently famous work wanted ad out one year prior to the release of this film. The animosity between the two is palpable in nearly every sequence, and Davis’ mocking impression of Crawford’s line delivery is either scarily good, or, if a voice over was used, an impressive technical trick that elevates what would be an ordinary moment in the film into truly disturbing sequence. The emotionally disturbing appearance of Davis resonates and reminds me of a similar performance by Ellen Burstyn in Requiem for a Dream (2000). Especially disturbing is the soundtrack, which plays off variations of a hauntingly sweet song entitled “I’ve Written a Letter to Daddy” written for the film. The mix of delusion, frenzy, and hopelessness that Davis brings to her performance of that song as a broken down and embittered late-life failure provides a moment in the film that leaves the view with a singular sense of pity. The film has quite a few Hitchcockian moments ( Rear Window comes immediately to mind as the wheelchair bound Blanche desperately tries to attract the attention of a neighbor). There is also some heavy commentary on the nature of the film industry itself. This film might not pack the same amount of suspense into two hours as some of it’s better contemporaries, but it is still relevant and gripping today. If you share my apprehensions about classic film this would be a good place to start working your way into the black and white era.